I had planned to do today's post on fun, local, non-traditional Valentine’s Day things to do with your significant other, friends or by yourself. But Monday night I successfully did crow pose in yoga and then immediately successfully face planted right into my water bottle. I felt like I should share that instead. And it’s my blog, so I do what I want. Sometimes yoga imitates life. Sometimes, it's not so pretty, but the result is amazing. 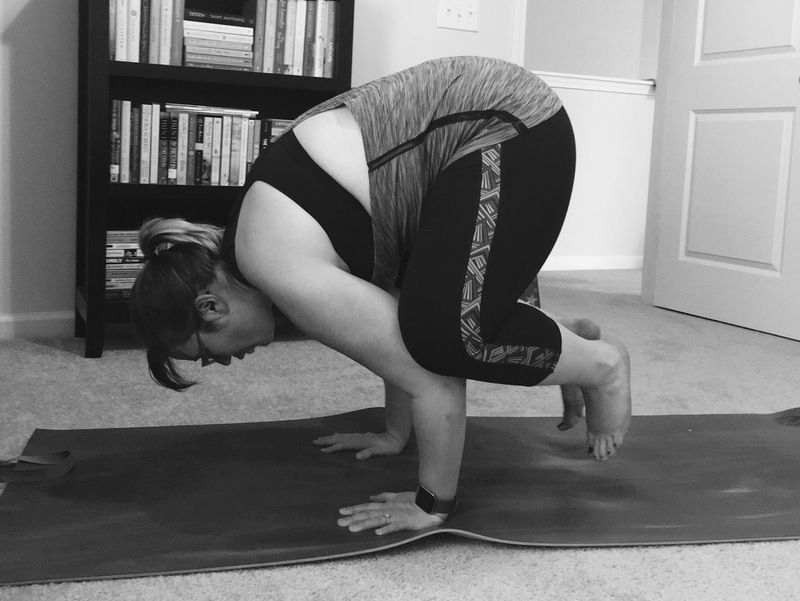 Finally able to hold crow pose! I still have a long ways to go with my legs. Crow pose has been this illusive yoga unicorn for me because it's core and balance. Anyone that reads this blog or knows me on a semi-decent level knows that I have very little balance or grace. My dad lovingly called me Miss Grace as a kid because I had none. I've been working on this pose, practicing it in every class, for about 6 months. And I finally got it! But I also immediately face planted. And no one, absolutely no one, should be amazed that I face planted when doing a balance pose. In fact, when I got home, I eagerly told Aaron to come check out my awesome crow pose and face planted again. That time, though, I think I sprang out of crow like a frog and belly flopped so my chin bounced off the ground. It was slightly painful, yet hilarious. Aaron really didn’t think my achievement was that great. In fact, he told me that he, too, could do crow and, honestly, in that moment if he had just popped into that pose, there is a good chance I might have stabbed him. Not fatally, just a flesh wound. But still, come on! I have worked for so, so long to be able to hold all my weight up on two hands. He thinks that other poses I do, like mermaid, are harder than that because crow’s just a balance pose. But those are the hardest for me! Yoga makes you think. It challenges you mentally and physically. Crow, for me, has probably been 50% mental and 50% physical. The mental comes from the place that I’m not a small girl and constantly think “that’s a lot of friggin’ weight on two arms, I can't do that” and the physical comes from the fact that it is actually a lot of weight to balance, for anyone, and requires a lot of core to be able to stabilize yourself. I’ve been so timid about doing it instead of just going for the stupid pose. I’ve lifted one leg, then the other. I’ve rocked myself up and then immediately back down. But never actually held it because I was terrified of the face plant. Monday I did both. I held crow and then I spectacularly failed and face-planted. But I got up and did it again. And held it a little longer. Aaron took today's blog pictures for me Tuesday night before class. I warmed up for a few minutes and then got back into the pose. I belly flopped again, and then magic! I held the pose twice, each time a little longer. I finally figured out that it's all core. I was finally able to hold the pose when I held my core super tight and focused just on that pose. Not on how I looked doing the pose, not on falling, but on making the pose happen. Not going to lie. I kinda hate this photo because I look like a large ball. 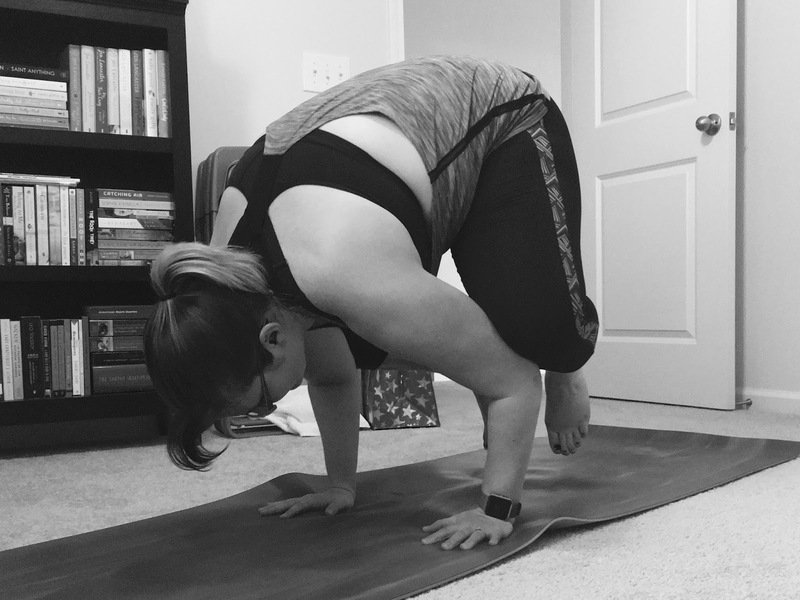 Yoga isn't always flattering. My yoga teacher likes to say that falling out is human and getting back in to the pose in yogi. But that’s not just yoga. That’s life. It's strength and determination. We push for what we want and fall spectacularly. Like belly flop. And it’s okay because you’re never going to get anywhere without that. And then you get back up and the magic happens. What if you stopped thinking about all the things that could go wrong and just went after something? So I ask you, what have you pushed for? What have you belly flopped on lately? How have you gotten back in your pose? Because this feels pretty dang awesome.